One of the best books I have ever read (although I didn’t realize it at the time) was The Structure of Scientific Revolutions by Thomas Kuhn. 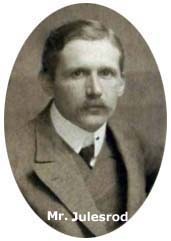 The main revelation of this book was that science, rather than evolving from one discovery to the next with smooth, logical and empirical purity, is subject to an evil called a “paradigm.” Kuhn’s “paradigm” is the adherence of science to a particular idea, often even in the face of conflicting evidence, resulting from a grand discovery. As time progresses and additional knowledge is gathered, there occasionally appear to be facts that contradict the previaling belief and these unexplained facts are usually censored or suppressed. Eventually, however, a new theory will come along that allows for both the accepted findings and the previously “unexplained” and, when this happens, the new belief system is reluctantly accepted and becomes the next dogmatic paradigm. Briefly, a paradigm is an idea, like, say, that the center of the Universe is planet Earth. This view, or paradigm, was held far beyond the discoveries of Copernicus because, simply speaking, it was convenient. The concept of God’s creation, Earth, as being one of many planets rotating around a central sun seemed to contradict the fundamental views of the Bible and the early Christian church. It was this same church that imprisoned Copernicus as a heretic and sought to suppress this view for decades. Back in this geocentric time, when the planets were viewed in the night sky, some odd movements were noted in the positions of Mars and Venus. These obvious planets seemed to move along the horizon, stop and then backtrack for a while, then resume their course. This minor glitch was ignored until it was proven by the deciples of Copernicus that these planetary movements were the result of expected and predicted observations being made of planets, from our own planet, all of which circle our Sun. Only then did the old paradigm die out. The suppression of unusual ideas, or ideas that upset the current paradigm, are not just rare occurrances in science. These same prejudices exist today in a number of areas, not the least or which concerns the origins of humanity and the events of our Earth’s past. Often, as we have seen with the Kennewick Man and the Piri Reis Map, there is the inclination to literally “cover up” certain archaeological findings that do not agree with the current dogmas. The Julesrod Collection, discussed here, and the Ica Stones (next issue) are two examples of this attempt to suppress valuable data. About 50 years ago, an amateur archaeologist named Val Julesrod discovered some unearthed clay figurines along a trench at the base of Bull Mountain in Mexico. When speaking to local farmers, he learned that these were frequently encountered in shallow burials, in groups of from 20 to 40 pieces each, in a wide strip of land at the base of the mountain. He eventually began collecting and then excavating the area for more of these figurines and eventually had a collection of over thirty thousand! The collection seems to have been the result of two distinct cultures. The oldest, stylized figures with large eyes and lips (above), were somewhat familiar to historians and resembled those of a culture that was known to exist in the area thousands of years before Columbus. Indeed, radiocarbon dating on these figures shows that they are 3500 years old. The other figures serve as the main controversy. They depict animals that strongly resemble camels, elephants, horses– animals not indigenous to the area– but also exact replications of certain dinosaur species thought to have been extinct for over 60 million years! The latter collection seems to be made from a singular clay source and has been dated to 1500 years old. This presents some problems to the current historical paradigm. Dinosaurs have been dug up and serious attempts to assemble their petrified remains only within the past 150 years. 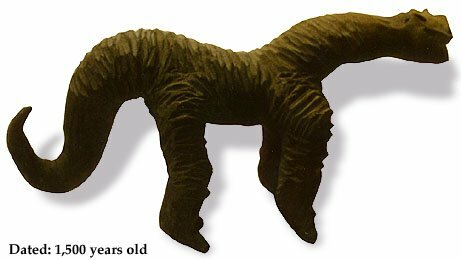 As early as two hundred years ago, the very existence of these gigantic creatures was largely unknown. In fact, new species are even now being discovered, buried deep in ancient Jurassic strata all over the world. Back 1500 years ago, the knowledge of dinosaurs was virtually unknown. Or was it? He knew the original collector, Val Julesrod, and spoke highly of him. According to Tierney, Julesrod was not interested in any financial gain from selling or carelessly speculating about these clay figures. He realized that their ultimate value was for all mankind, and he trusted that they would, someday, be an important clue to understanding human history. So far, these figures have just frustrated all attempts at their interpretation. 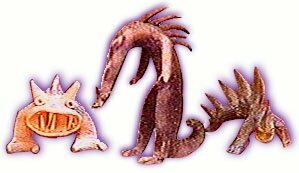 Many clay figures show details of Stegosaurus, Tyrannosaurus Rex and Pterodactyls, both alone and in various interactions with human figures. Disappointed by the lack of scientific interest in his findings, Julesrod thought his discovery would finally see the light of professional scrutiny back in 1954. The Mexican Government sent a highly esteemed team of four archaeologists to examine the clay pieces and the earthen sites of their origin. At a location of their own selection, the team made two excavations and uncovered a collection just like those of Julesrod. They all seemed excited by the find and stated that they must, indeed, be authentic. Three weeks after their return to the University, their official report concluded that they could not be real because of the fantastic representations of both humans and extinct dinosaurs. They disregarded the dating experiments, and the Julesrod’s discovery was again suppressed until now. 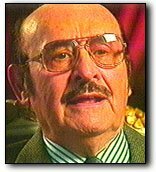 In the 1960’s, famous scientists Charles Hapgood and television’s Perry Mason director, Earl Stanley Gardner, visited the village to look for evidence. Hapgood noticed that much of the village had expanded with increased population, and that many houses were now constructed over the base of the Bull Mountain area where the clay figures had been initially found. He suggested to Gardner that they might try digging under the foundation of one of these older homes as a way of locating the clay relics and of proving that these artifacts were not artificially buried as some kind of hoax. Digging through the hard packed dirt floor in one of these older homes, Hapgood’s effort yielded 43 specimens of the controversial type of the Julesrod Collection. To Hapgood and Gardener, this was proof that the artifacts were very real and not a recent hoax. Their collection is now on public display in the Mexican town’s museum but no further scientific research has been done. Neil Steede, a scientist living in Missouri, calls himself a “contractual archaeologist” and is frequently paid by institutions or museums to examine controversial claims. Since he has no vested interest in the results, his approach is refreshing and usually unbiased. His look at this collection, up close and in detail, is the subject of an extremely well documented video, Jurassic Art, available at BC Productions. In this video, Steede confirms the date of the clay figures, but points out some possible flaws in the dating and analyses. Although he does not confirm or repudiate the authenticity of this find, his discussion of their implications is both shocking and controversial. According to Steede, either our human history goes farther back in time than we ever imagined or the existence of dinosaurs– a species believed to have been extinct for 60 million years– survived to more recent times in human memory and mythology. Steede questions whether or not the carbon dating reflects the time when the figurines were made and fired, or whether the test simply indicates when the clay itself was formed by nature. To add suspense to this clay collection, a much older collection of carved stones has been found in Peru which also depicts several extinct species of dinosaurs, flying machines, heart transplants and men looking at stars with what appear to be telescopes. High atop the Andes Mountains, the “Rockies” of South America, there is an arid region in Peru that is both unusual and unnatural. Seen from the air, this region could easily be mistaken for an abandoned airport. Someone has carefully cleared and carved a series of laser straight lines that span many kilometers. Most of these lines are just wide enough to be called a path. Other areas form huge rectangles and trapezoids, hundreds of meters in width and length. Indeed, it looks as if the area was made to accommodate a fleet of DC-747’s, But these “runways” are thousands of years old. This is just one of the many mysteries to be found in the region. On neighboring mountain tops, the intact remains of walls and buildings can be seen. This architecture is all made from massive stones– some weighing as much as a locomotive– each meticulously carved and transported to the high peaks from a quarry some five miles away. The precision of each stone’s final finish is so exact that there was no need for mortar or cement. The stones are joined so tightly that not even a pin can be inserted between them. When the Spanish came to Peru and discovered this construction, they asked the native people if they had made these huge monuments. But the natives of Peru had only legends of “the ancients” that came and went, long before they established their villages. Their identity is still a mystery. 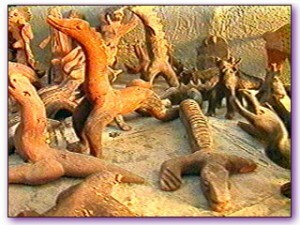 Images on the Ica Stones show human type figures riding in Pterodactyls while hunting dinosaurs (left), an amazing global map showing the continents (center), and other activities not yet understood. In this area, rain is infrequent. In the mid 1960’s it rained a lot. The dry washes quickly filled to capacity and normally calm rivers were scoured by the torrential flood. In a small town near the Nazca lines, the narrow Ica River was eroded away along the banks, revealing several hundred carved stones that had been buried in subterranean chambers. As the water receded, the carved stones were left on the Ica’s banks. As the locals began to collect these stones, a particular image of a fish caught the eye of Dr. Javier Cabrera, the town’s physician. Dr. Cabrera recognized the outlined image as that if an extinct species of fish. His curiosity peaked, he sought more of these stones. Gradually, the villagers knew that he was interested in these strange objects and so they gave him what is now his collection– something Cabrera calls his “library”– of stone enigmas. The stones come in all sizes. There are small ones that can easily fit your palm and there are rocks as large as a dog. 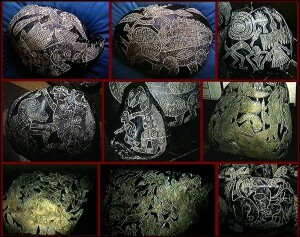 All of the stones have images that have been carved with continuous lines etched into the rock surface. The etching reveals a lighter color than the original dark varnish of age, yet the etched grooves also bear traces of this varnish, indicating that the carving was done in ancient times. One could easily attribute these stones to any pre-Columbian civilization were it not for the uncanny and unmistakable pictures of dinosaurs, humans flying on Pterodactyls and vivid scenes of human heart transplants and continental world maps. Sophia Melewska is a Geomorphologist who was commissioned to investigate the rocks, summarize their content, and comment on their authenticity. After studying the collection of Ica stones, Dr. Melewska said that she was in a state of “intellectual shock.” The art that surrounds the entire rock face shows evidence of an advanced civilization that knew about surgery, the history of man’s past, and the Earth’s evolution. But how? Melewska is one of the scientists now trying to direct the attention of professional research toward this mystery. But her battle is a tough one. Unlike clay figurines that have organic material (i.e. straw) in their composition, there are no organic materials in plain old rock that will tell anything of its age. Traditional radiocarbon dating techniques rely upon organic material (that was once alive) to determine age. The surface of these rocks, however, has a varnish that is the result of bacteria and minute organisms which have adhered to the surface. A good black varnish or patina will take thousands of years to discolor and coat each stone. Etching these rocks would have removed the existing varnish, revealing the bare rock. Since these rocks have developed additional varnish in the grooves, it seems likely that they have were carved a long time ago. But how long? In their video production, Jurassic Art, the producers again sent Neil Steede to examine this phenomenon. Neil, as was suggested with the Julesrod report, is unbiased. He travels the globe looking at stones and listening to all sorts of claims and stories. Some stories are blatantly fake, while others seem shockingly real and genuinely perplexing. Neil examined the varnish on the stones but was not able to guess at the date. They looked old, but exactly how old was old? In cases where no organic material can be dated, the setting and strata where the objects are found can often give a clue to their age. Unfortunately, since these stones were revealed by accidental erosion, their original resting place is not known. Perhaps there were other ways of determining their age. 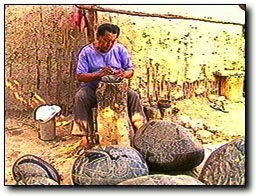 Acting on a rumor, Steede traveled to a nearby village where he met a local man who was in the process of carving similar stones for tourists and anyone else that could be duped into believing that they had a piece of antiquity. The rumors of Dr. Cabrera’s collection have brought tourists to the area, seeking what they are assured are the “real stones.” Steede found that the artist managed to emulate the style on the Ica stones, but his technique was not quite as good. Moreover, the tell-tale varnish was absent from his grooves. Despite this, skeptics point to these reproductions as proof of a hoax, and dismiss any serious study of the original collection which is still maintained by Dr. Cabrera. 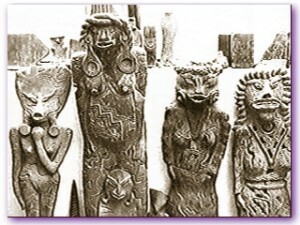 And if reproductions were not enough to cast doubt on the age of the Ica stones, their fantastic images of extinct animals and flying humans inhibit any serious scholar from taking a second look at the phenomenon. If these stones are to be taken at face value, the time frame of our past history is askew. Either humans were able to remember dinosaurs and medical procedures as part of their history, or some species of dinosaur lived to fairly recent times. Of course, dismissing them as a hoax is the easiest way to avoid this brain teaser. 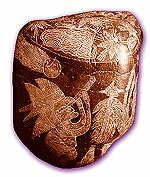 But since the stones seem to be associated with a culture possessing highly developed engineering and mathematical aptitudes, it is not an impossibility that such civilization might also have had knowledge of Earth’s history and human evolution. Could dinosaurs have lived until recent times? There is some evidence for this. Certain species of animals, thought to be extinct, have been found frozen and preserved. Mastodons (a type of hairy elephant) have been found in Siberian ice. These animals could have survived through the last ice age, some 13,000 years ago. Their bodies were so intact that, upon autopsy, fresh daffodils and sweet grass was found undigested in their stomachs. Unfortunately the stones do not show Mastodons, and no frozen dinosaurs have yet been found. So the question to be answered is this: If there was an advanced civilization in South America thousands of years ago, why did it vanish? Who were they? How did they know of dinosaurs and stone masonry? These questions are brought to clarity in the video, Jurassic Art. Surprisingly, a sane answer is available and will be the subject of the next chapter in the amazing history of this third rock from the Sun.